You usually see kids today with their hands and eyes on their computers, tablets, and smartphones. Over the years, this has emerged to be the new normal in modern society. Then again, it should be noted that this might not be the most ideal way for your kids to grow and develop. Too much exposure to and focus on these gadgets can have a huge negative impact on their health and wellness. 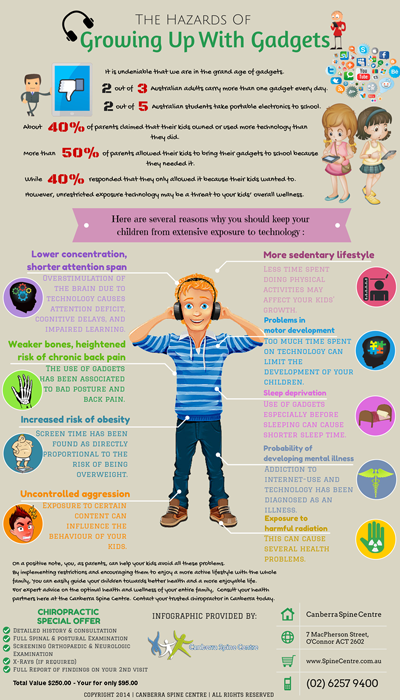 Parents should be more aware about how excessive and unrestricted exposure to technology affects their children. In addition, you should also encourage your kids to develop a more active lifestyle. You can start by bringing the whole family outside the house and away from those gadgets to enjoy a recreational activity together. In this way, you can protect your kids from the health risks brought about by gadgets. For more expert tips on the well-being of your entire family, consult your reliable health partners here at the Canberra Spine Centre. Your trusted chiropractor in Canberra is committed to helping you enjoy more out of life by providing you with holistic approaches when it comes to improving your overall wellness. Call us today on (02) 6257 9400 or book an appointment online to claim your Chiropractic Special Offer.